Just like with offensive statistics, defensive statistics take time for samples to build up. But there was one number from the early-season metrics that I wanted to at least look at a little more closely – Bryce Harper’s -5 Defensive Runs Saved. 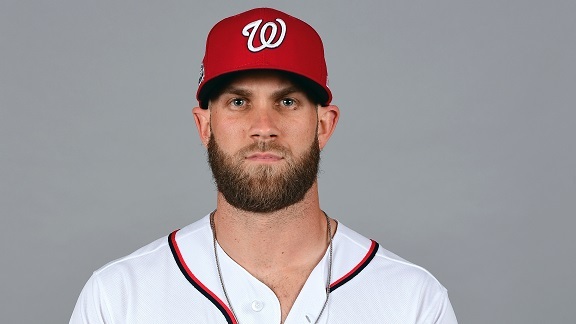 Harper had saved 28 runs defensively in his first six seasons for the Nationals, half of those coming in his rookie season, primarily as a center fielder. He’s typically been an average to good defender the last five seasons. As a rightfielder, his range is alright. He catches balls hit to the shallow part of the ballpark at an above-average rate, but is slightly below average on deep balls. He makes up for any deficiencies with the deterrent value of his arm, which has saved eight runs, six the previous three seasons. So what’s going on with Harper’s defense in 2018? Let’s start with a point. We’re not here to disparage Harper. It’s too early to make judgments on this stat, just as it’s too early to judge Jed Lowrie’s amazing offensive start. This is a look at how the number is what it is. Harper’s range and positioning rate below average and this is a case where a few plays in a small sample are damaging in the short term. In the opening week of the season, Harper turned the wrong way on an Adam Duvall fly ball that he missed with a jumping attempt near the wall, resulting in a double. He also couldn’t get to base hits by Jay Bruce and Zack Wheeler that were hit in front of him, in which it looked like he played the ball conservatively, which dinged his rating. He didn’t lose anything for missing a foul ball hit along the right field foul line (in chilly weather), but it fit with the other two plays in that it looked like a ball that Harper could have caught. Our video review has Harper with 1 Good Fielding Play (GFP) in 25 games, a sliding catch on a Billy Hamilton line drive. Harper’s GFPs have dropped from 28 in 2015 to 24 and 12 the last two seasons (granted, last season, he only played 110 games compared to 140-plus the other two seasons). Harper’s arm also has not produced any value yet. There have been 22 instances in which a baserunner had an opportunity to take an extra base (first to third, second to home, first to home) on Harper. Fourteen succeeded (64 percent … his rate was 42 percent the last three seasons). Among the plays that hurt his ledger – a bobble in the right field corner on a DJ LeMahieu double that allowed a Rockies runner to go first to home (Harper got a “Mishandling Ball After Safe Hit” misplay). Harper also was slow to go after a hit by Ozzie Albies on which Albies’ hustle turned it from a single to a double (Harper received a Defensive Misplay for “Giving Up On The Play”). So what conclusions can we draw from all of this? Each of the plays we listed isn’t highly impactful on its own, but little things add up within a short period of time. Based on video observation, it seems that Harper’s results are in line with the eye test. But just like every major league hitter has a 25-game blip, it’s entirely possible that this is just some small-sample struggle that will even out over time, as Harper accumulates his share of good plays. We’re not making any judgments from this small a sample. But just in case it continues, you’ll have a better understanding as to what’s behind it.